Gros Morne will command your attention with beauty like this view overlooking a spectacular fjord. 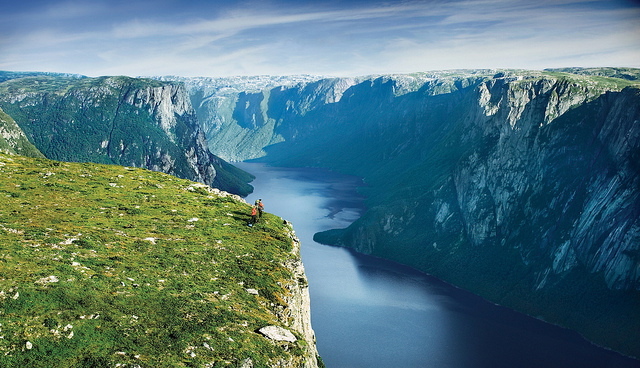 GROS MORNE NATIONAL PARK, NEWFOUNDLAND & LABRADOR — I had visions of being swept to sea. It would be a fitting way to end this trip, I suppose. But it was not what I wanted at the moment. The water was icy and rushing hard against my legs all the way up to my knee; my toes felt for support among the stones on the riverbed. I had come too far, trodding over slippery, shoe-sucking muddy paths, to turn back. But I wondered if I could make it to the other shore without falling into the, um, brook, swollen from the heavy rains the night before. For my final couple days in Newfoundland, I wrapped up where I began: at Gros Morne National Park. The rewards of hiking at Gros Morne should be apparent with this view on the Western Brook Pond Trail. I knew almost from the moment I first drove into the park that I really needed more days than I had allotted in order to explore the place properly. Somehow on the map Gros Morne looks smaller than it is, and it doesn’t really give an accurate picture of the dizzying array of environments found within the park. While in the north, I prayed that the weather would behave for my last two days so that I could get in some good hiking before heading home. Luckily, it did. On Saturday, just after I entered Gros Morne, I stopped for a quick loop on the Western Brook Pond Trail. Most of it was an easy stroll on boardwalks suspended over peat bogs. The endpoint was the mouth of the inland fjord of the “pond” (the names of places in the park do not seem to indicate scale in the way you and I might!). I regretted immediately that I had not pre-booked a boat trip through the fjord; it was easy to see just how spectacular it would be up close and personal. Even a Swiss couple — from the Alps! — were impressed. After munching on a mooseburger with all the fixins’ at Earle’s in Rocky Harbour (it tasted a lot like lean beef), I drove to the southern edge of Bonne Bay to my final stop in Newfoundland — the little harbour town of Woody Point. This is the access point for much of Gros Morne’s south-side attractions. Although the clouds were beginning to roll in, I drove up to the nearby Discovery Centre, where I picked up the steep trail to the top of Lookout Hills. Here, the name was more than apt. Once at Lookout Hills, you get an almost perfect panorama of the park: the branching tree of Bonne Bay, the bald head of Gros Morne Mountain, the forested valleys, and the Martian landscape of the Tablelands. The Tablelands apparently are a geologist’s dream-come-true. Composed of a piece of ancient mantle that got thrust to the surface by plate tectonics, this part of the park looks more like the American Southwest. Almost nothing grows on the Tablelands because the rock is composed of peridotite, which I am told lacks the nutrients needed for plants to grow. My last hike of the day was a wander along the base of this odd geologic zone — until I felt my first drop of rain. Time for dinner. After three hikes I was quite hungry. I drove down to the seaside town of Trout River (ok, almost all the towns are seaside). There, I consumed my first Newfoundland lobster, pulled right out of the frigid waters. Why does eating a lobster always feel a bit like murder? Well, go ahead and call the cops it was delicious. I didn’t even mind the rain lashing at the window. I had feared the rain of Saturday evening might stick around, but I woke to find perhaps the best day of my trip so far. I was excited: I would get to tackle the Green Gardens Trail. The name is appropriate, if a little deceptive. It sounds so easy, just a garden stroll. 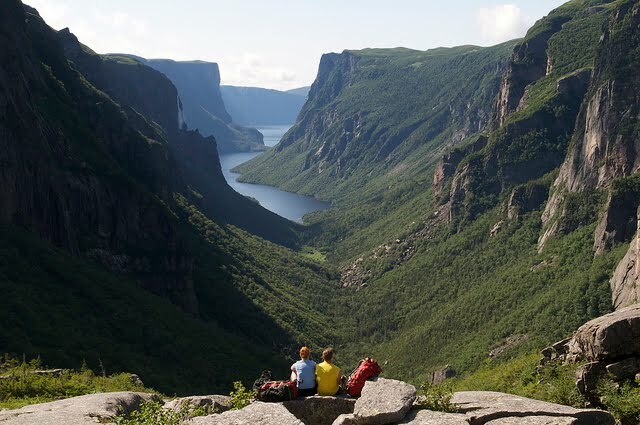 But actually it is one of the most strenuous of the day hikes in Gros Morne (the other is to the top of the park’s eponymous mountain — but that is on the other side of the bay). What I didn’t fully take into consideration when setting out on this jaunt was that despite the perfect hiking weather — blue skies and cool temperatures — the previous night’s rain was going to make the trek a touch more difficult. But just a touch. There are two trailheads for the hike, one at Long Pond, the recommended starting point for the “easy” short version of the hike, and the other at Wallace Brook. Guess which I chose? Almost as soon as I got on the trail, I realized it was going to be a tad wet. Ok, a lot wet. Long stretches of the path were black pits of mud, going uphill, both ways. This was due to the rain and the lush greenery of the forest, so different from anything I had seen in Newfoundland. It also bespoke a wetter microclimate. As I got deeper into the forest I almost felt like I was entering Jurassic Park, surrounded as I was by thick stands of tall fern. The “green gardens” name quickly came to make sense to me. I was happily slogging away, climbing and descending the muddy mountain and valley path, when, at about hour two of my hike, the trail ended abruptly at the bank of Wallace Brook. No bridge, no walkway. Just a sign informing hikers that one must ford. The river was running fast and high. I reached my hand into the water: icy cold. My options: 1) turn around and retrace my muddy steps for another two hours; 2) figure out a way to actually ford without killing myself in the process. Rather than crossing at the “official” point I searched out a narrower section, closer to where the river spilled into the Gulf of St. Lawrence. My chosen spot was a bit deeper, but I figured I would have a better shot of flinging myself at the other shore if I fell. So, hiking shoes and socks in hand, I took a deep breath and waded in. And, success! I was not swept out to sea. That was perhaps the toughest bit of the hike, but I still had another four hours, at least, ahead of me. And as I was to discover, part of that consisted of arduous upward climbs. However, the scenery that awaited on the shore made it so worthwhile. At times, it was only me and some errant sheep on the meadows lining the high cliffs.